How can I limit battery charging to 80% capacity? How can I do this in Ubuntu? The charging thresholds are, very unfortunately, firmware and vendor specific. The Lenovo ThinkPad user is luckily provided with a solution outlined on ThinkWiki. Then it will stop charging once it reached 80% and only start charging when it drops below 40%. Toshiba and others might have a similar kernel module that exposes firmware functionality to the /sys or /proc space, but it is very unlikely for patent issues. For the same reasons, an application that could handle this would be either Thinkpad- specific or only address a few select vendors. sudo ./tpacpi-bat -g ST 2 # when is external battery loaded? For reference, I did this on debian testing but I'm sure it works in ubuntu just as well. One of the parameters it controls is maintaining battery charging limits. It still works only for Thinkpads, but given the nature of the project—if the appropriate drivers for other devices will become available, it is likely these will get integrated into this project too. So if you're reading this comment in few years, check the documentation, maybe your device is actually supported. Ubuntu packages are available in the official repository. When I boot on Linux (Ubuntu, Mint, etc), the maximum charge is still limited to 80%. Therefore, the Toshiba Power Saver seems to store its configuration into the bios. The only drawback is that if I want to travel with a fully charged battery, I have to reboot on Windows and change the Power Saver configuration. Did you check to see whether there is a BIOS setting on your laptop for this? My laptop had a Windows Application as well as a "Battery Life Extender" setting in the BIOS for this exact feature. Very often (almost always) this is an option in the BIOS that Windows can change remotely. It's very difficult to remote change this in Linux. My suggestion? When starting up your computer, smash the function keys, specifically F1, F2, F3, F6, F8, F10, and F12. One of these (maybe another) will put you into the bios menu. It says which key on startup, but it doesn't usually stay up long enough. Look for power settings (only arrow keys here, no mouse). Find batter saver or batter optimizer or something along those lines. Change that to enabled, and then save and restart. This should do it. Linux tends to freak out when the battery doesn't charge past 80%, but it will just ruin your expected charge times. Nothing to worry about here. Not the answer you're looking for? 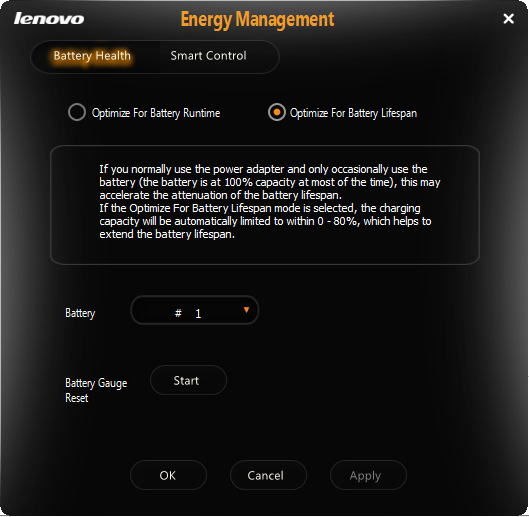 Browse other questions tagged laptop lenovo battery thinkpad optimization or ask your own question. How do I load the tp_smapi kernel module on a Lenovo Easypad? Is there a Dell Longevity option in Ubuntu? Can I stop battery charging at say 80% and switch to AC? How can I stop charging my battery at 60%? How do I turn off battery charging in Ubuntu? how to disable charging in ubuntu when battery level is above 80 percent? Is it possible to run laptop over direct supply and turn off battery charging? Battery design capacity is zero? Battery stopped charging: How to turn off Battery Charging Indicator?